I love Bisquick shortcake as does everyone in my family. Often, I whip up a batch of these goodies, and I serve them to guests who come back asking for the recipe. and other questions which have led me to believe that many people may not know what Bisquick is. Thanks to this, I will cover what Bisquick is and ways you can make your own before getting to the Bisquick shortcake recipe. If you are like me and you already know what it comprises, or you would rather get to preparations before reading through all these details, you can jump to the recipe right now. That said, let’s get started! I have been using this brand for so long that when my friend asked me what it was, I must admit that I got taken aback. It’s one of those things that I expect everyone would know, but she proved me wrong with that one question, and I am now more careful when giving recipes. I want to ensure that people can understand what it is that they are using in their foods and why. Bisquick is a pre-mix which you can use in baking, and it makes things easy when you are in a hurry to get things ready. It’s also a fantastic go-to for a budding cook who is yet to master the art of combining ingredients as per the recipe’s instructions. General Mills operate its manufacture, and it falls under the Betty Crocker brand. Many people think that Betty Crocker is a real person but the truth is that the brand is fictitious. However, this does not affect the quality of its products which are now available across the globe. I look to them for lots of stuff owing to this. Typically, Bisquick will contain baking powder, flour, salt, and shortening. These ingredients are what you would get in a store. If it comes to what you make in your kitchen, well, the components will vary by a great deal. The story behind this brand is quite interesting if you will oblige me to get into it. It all started in 1930 when a top sales executive from General Mills came across a dining car chef. This chef amazed the exec by presenting him with fresh biscuits that were quite delicious. The exec did not hold back on his compliments, and it was during the exchange that the chef let on that he had used a pre-mix to achieve the fresh batch. He then added that the mix contained salt, lard, baking powder, and flour. The chef would store the mix on some ice, and whenever he needed to bake a fresh batch of biscuits, he would use some of it. As a result, he was quite efficient in his cooking as he ended up using less time in preparation. The exec took note of everything, and once he finished his business trip, he went home and created the Bisquick that we know today. There were some changes to the pre-mix though. While the chef used lard, the new recipe used hydrogenated oil. In this way, people would not have to refrigerate the mixes. In 1931, people could get the pre-mix from stores across the country. 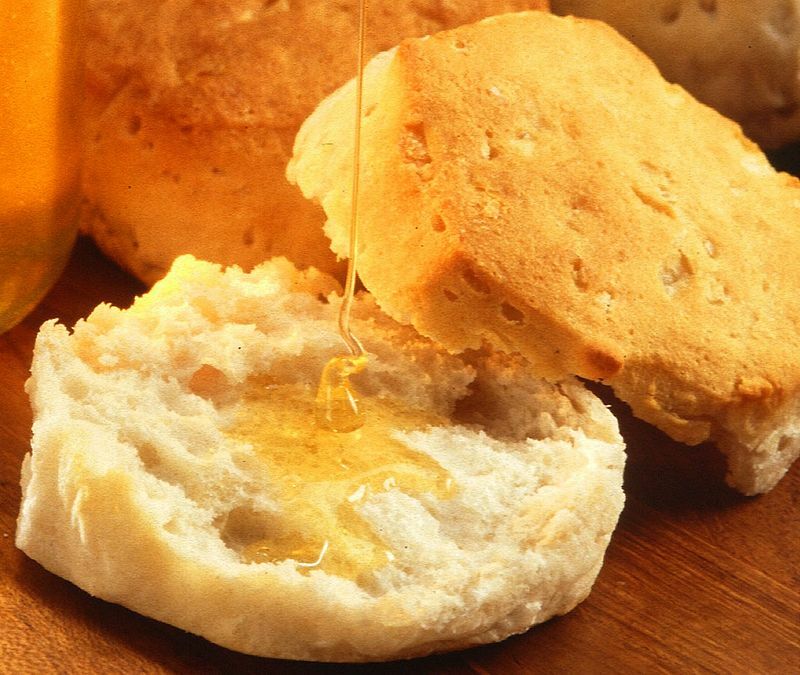 At first, people used it to make biscuits before they ventured into other recipes such as pancakes, pizza dough, and dumplings. Given that it comes in a box and is ready to use, this brand has grown quite popular over the decades. All you need to do is to add some milk and eggs to the mix, and you’re just about good to go, depending on what you wish to make. It is quite easy to get curious as to what is in the box and whether it is healthy for you and anyone who eats the shortcake you are about to make. Though there is nothing dangerous contained in the pack, you should note a few things. The ingredients listed on the box include enriched flour bleached which points to the presence of wheat flour, folic acid, niacin, riboflavin, iron and thiamin mononitrate. Additionally, there is partially hydrogenated soybean and cottonseed oil. You also have leavening in the form of baking soda, monocalcium phosphate, and sodium aluminum phosphate. The last two ingredients are dextrose and salt. Most of these components are easy to understand, save for a few. It’s easy to start wondering what riboflavin is and why you need it in your mix. However, most of the ingredients in play come into the picture once the processing is over and they act as nutrients and emulsifiers. If you want a further breakdown of the nutrients, I’d be happy to do it. Who am I kidding? The cog wheels are already turning so here we go. We all know how vitamin B is essential when it comes to healthy immune systems and niacin and thiamin mononitrates are forms of this vitamin. Riboflavin too is another form of vitamin B, which you would typically find in foods such as greens, dairy, and legumes. The reason that the word enriched appears in the ingredient list is that these vitamins are not naturally occurring in standard wheat flour. Given that they are additives, Bisquick has to stipulate this. Sodium aluminum phosphate and monocalcium phosphate are leavening acids typically found in baking powder, so there’s not much to say about this. The same goes for dextrose which is another name for glucose. Now, the issue comes in regarding the partially hydrogenated oil in the mix. While this may be a standard component in processed foods, it has proven to a challenge to people’s heart functions. For this reason, you will find that Bisquick Heart Smart uses canola oil as opposed to partially hydrogenated oil. The same does not hold for Bisquick original which contains partially hydrogenated oils. Now that you know what is in the box, I trust that you will have an easier time with this recipe. It’s not always that I am up to work on a recipe from scratch and sometimes I am looking for a shortcut. It is at such moments that I use Bisquick. There is that misconception that using something that was pre-mixed can alter the flavor but that’s just that, a myth. The truth is that the results are flavorful and you get to spend less time and effort when whipping up a batch of this delicious dessert. It’s so easy to make that I can do it immediately after waking up and I even allow my nieces in the kitchen to help out. There’s not much that can go wrong when making it. 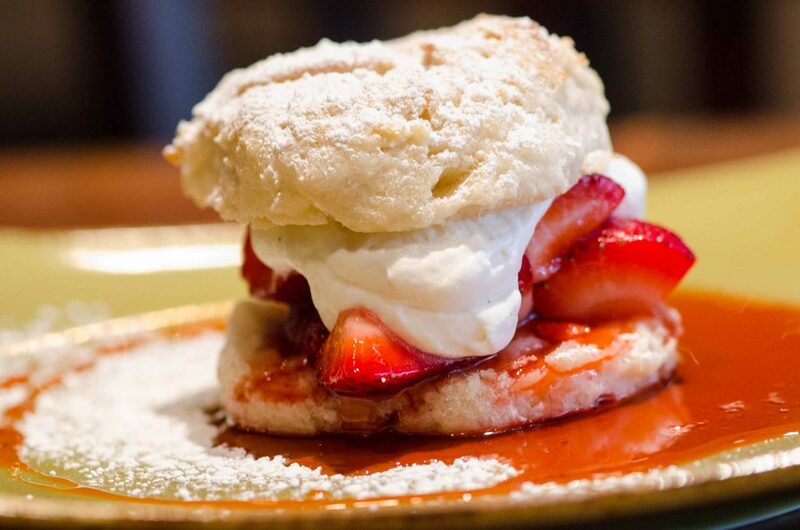 Here’s what you should expect in the shortcake: freshness and flakiness that is the accurate depiction of perfection. And with some strawberries and whipped cream in play, you will be licking your fingers in delight. Now, there is something that you need to know about the Bisquick mix. 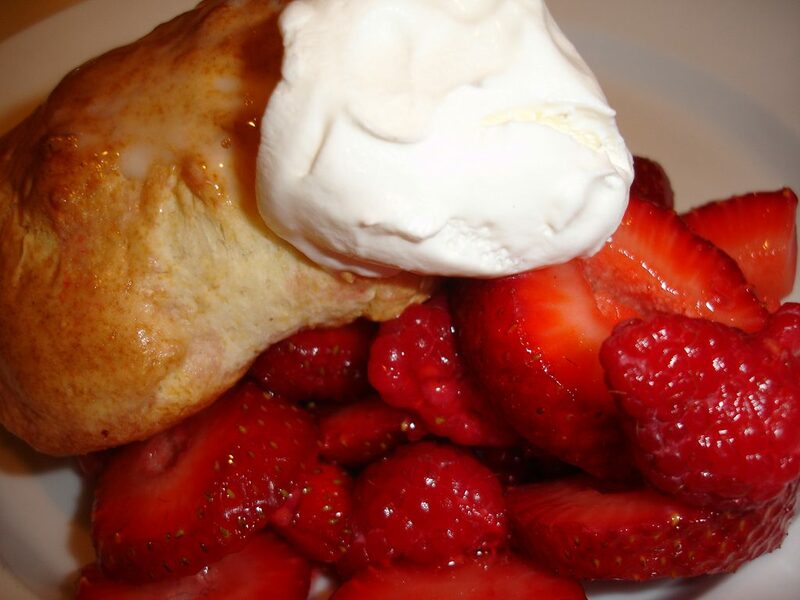 While it will provide you with the basis for this recipe, you can always tweak it to get more out of the shortcake. It’s a bit plain if you ask me but that’s okay for anyone who is trying to cut back on sugar. I add some sugar and vanilla to it when preparing the batter to ensure that I get more flavors in the shortcakes. And the whipped cream and strawberries, in the end, will do wonders to what is otherwise a simple recipe. If you tell someone that it only took you twenty minutes to get it done, the chances are high that they will be skeptical. It’s pretty easy to make and I know I’ve said this so many times, but I still can’t get over how good it is with little effort in play. Even the ingredients are a show of how easy it is to make these shortcakes. But I am getting ahead of myself, and I should let you figure this out on your own. I get a lot of questions as to why someone may follow my recipe to the letter and yet their results are not as excellent. Here is the thing. When it comes to baking, you want to ensure that the oven is evenly heated such that when you place the baking tray with the batter inside, the cooking starts immediately. Most of the time, people begin by preparing what they want to cook, and once they finish, they grease the pan as they pre-heat the oven. This system is wrong and can backfire on you when baking sensitive things such as cakes. You should always start with the pre-heating before moving on to other preparations. As such, this is my first step. Set your oven to pre-heat at 450 degrees Fahrenheit. While it heats, you can work on other things. Keep in mind that you will not spend much time in preparation and each second used in pre-heating will count. Take the chopped strawberries and transfer them to a bowl. Sprinkle the two separate tablespoons of granulated sugar on the fruits and let them sit in the bowl. Given that you have chopped them, strawberries will start releasing their juices and I’ll let you in on why this is important later. Combine the Bisquick and the quarter cup of sugar. When it comes to this step, it’s up to you as to how you want to go about it. If you don’t like much sugar, it’s probably a good idea to stick with the amount in the mix. If not, then add as much as you would like. I’m kidding though. Stick to a quarter or so for your first batch. Next, add the vanilla for some flavor and the milk. Mix the ingredients well until they evenly combine. The result should be sticky. Divide the batter into six and place the discs on the baking sheet which you will then transfer to the oven. By now, the heat in the oven should be sufficient to cook them evenly. Let the baking sheet sit in the oven for at least eight to ten minutes. If they have turned golden brown by the eighth minute, you can remove them from the heat. If they are yet to attain this hue, let them cook for two more minutes before removing them from the oven. Transfer the shortcakes to a cooling rack and give them some time to cool. Once they are ready, you can then proceed to cut them into two in preparation for the cream. Divide the whipped cream and strawberries according to the shortcakes. Fill the middle of the pastries with the cream and some strawberries. Place the top half on the shortcakes and pile on the remaining cream and strawberries. Your desserts are now ready. How easy was that? 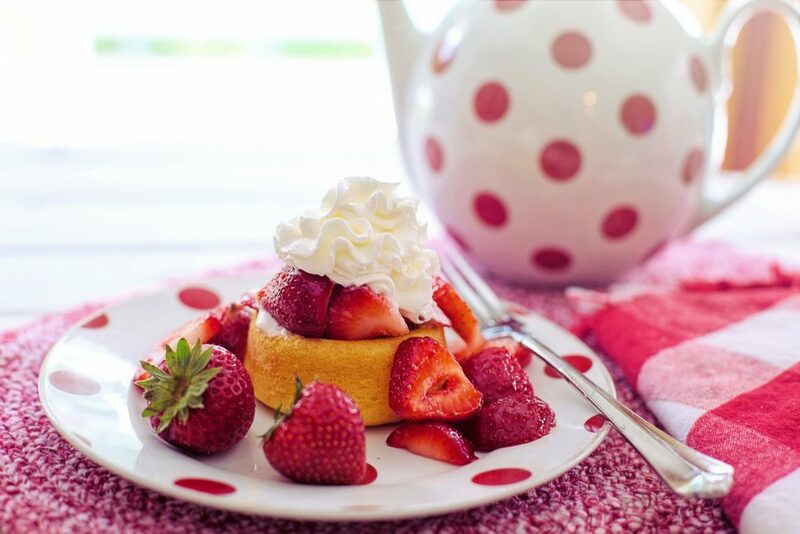 Read on for more tips on how to get the most out of your shortcakes. 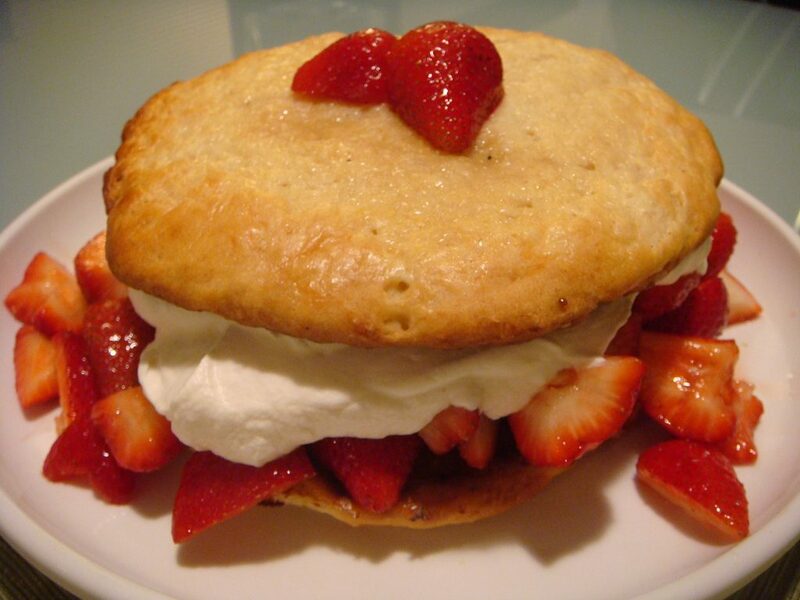 But before we get to that, here is another Bisquick shortcake recipe that you will love. This is another shortcake with Bisquick variation. The shortcakes are amazing; that’s for sure, and you can always have something in hand to feed people when they come to your home. But there is a lot more you can achieve with Bisquick and this is another way to wow your loved ones. The prep time for these squares is thirty minutes, and you will spend about one and a half hours doing this. However, most of the time revolves around waiting for processes to end so it should not be that strenuous to handle. The upside to this recipe is that you can serve fifteen people at a go. Suppose you want to make your kid’s party a delight, pass these squares around and you will see the difference. And you probably have everything you need to make them in your pantry right now. You can opt to use margarine instead if you don’t have butter. It won’t affect the results much, and you will love how great the squares will taste. Yum! Also, feel free to alter the sugar to your liking. But on the first go, it’s always safer to go by what the recipe states. Start by pre-heating your oven to 350 degrees Fahrenheit before doing anything else. Take a 13”*9” pan and line it with shortening or another greasing agent that you deem suitable. Lightly flour the pan. You could also opt to spray the pan with some baking spray and flour. You are now set and can move on to other steps. Combine all the cake ingredients in a bowl and beat them with an electric mixer. Ensure that the mixer is on low speed to ensure that you do not over-beat them. In about thirty seconds, you should have finished. Turn off the mixer and scrape off the batter on the side of the bowl. Gently mix the dough before pouring it into the greased pan. Place the pan in the oven and let the batter cook for thirty minutes. At this point, insert a toothpick in the center and check if it comes out clean. If it does, your cake is ready. If not, let it cook for an added five minutes before performing the toothpick test. Let the cake cool in the oven for a while before moving it to a cooling rack for an hour. Once the cake is at room temperature, you can now work on the frosting. Place a bowl in the fridge for about ten minutes to chill it. Pour the whipping cream into the bowl and beat it with an electric mixer on high speed. Keep beating until you can see soft peaks forming on lifting the mixer. You can now set the cream aside. Using a separate bowl, combine vanilla, powdered sugar, and cream cheese and beat the ingredients on medium speed until they blend evenly. You can now fold in the whipped cream. Ensure that you scrape the sides of the bowl to get all of the cream. You can now frost the top of the cake with the mixture. If you would like to serve the cake chilled, you can place the cake in the fridge for about six hours before serving it. When serving, be sure to divide the cake into squares, depending on the number of guests. You can then place the pieces on dessert plates and top them off with some strawberries for an appealing look. If you like, you can add some mint on top to get a burst of flavors. Start by washing the berries before cutting off the stems and leaves. You can then snip a bit off the top before cutting them in halves or slices, being mindful of their sizes. Let the pieces sit in a bowl and sprinkle some sugar on them. In about fifteen minutes, they will have released enough juice, and you can then use them on the shortcakes. If you do not want the juice, you can skip the sugaring. The strawberry shortcake is such a favorite dessert that it has earned a place in so many of our holidays. As such, there have been many variations on the original Bisquick shortcake recipe. Here are a few tips to help you get it right each time. The thing with Bisquick shortcakes is that they are very easy to prepare. Even newbie bakers can get it right as long as they follow the given instructions. You’ll be happy to know that you don’t have to be as precise as you would be when dealing with special desserts and with a few simple steps, you will have the biscuits ready. 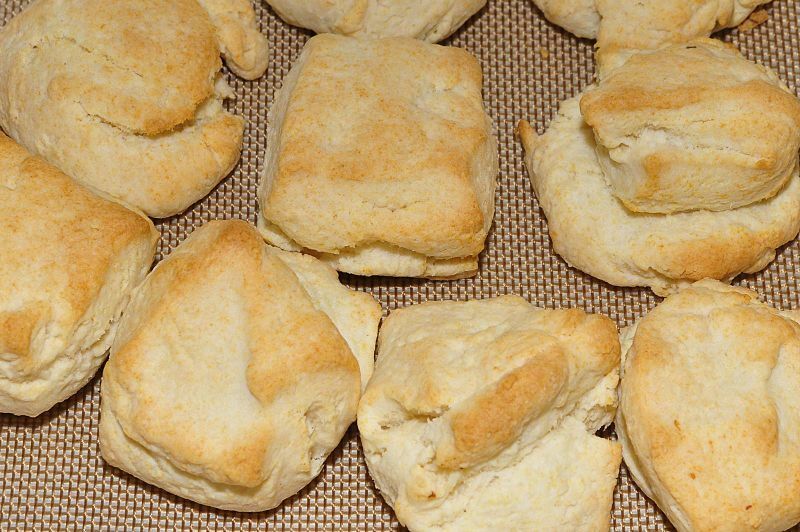 The secret lies in the baking powder which makes the shortcakes puffy and delicious. With this in mind, you will have an easier time with the preparation. 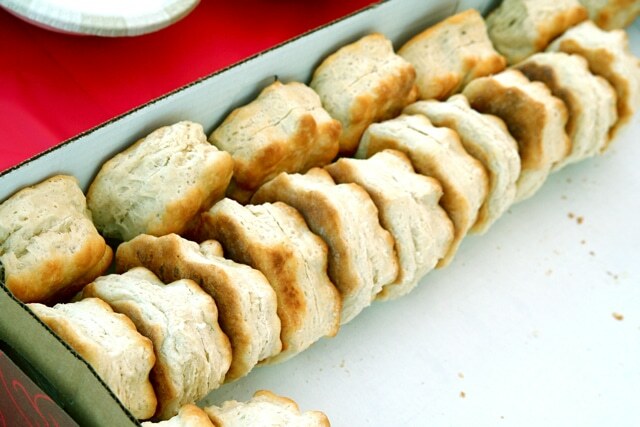 You can choose to have the shortcakes in the standard manner where you go by the original recipe. While this works just as good, you can get better results by adding flavor to the ingredients. The most common way to do this is the inclusion of vanilla essence in the preparation. However, there is a much simpler and more gratifying way to add flavor. Mix the sugar you intend to use with fresh lemon zest such that the granules absorb a lot of taste. You will feel the effects in the scent as well as in the taste. 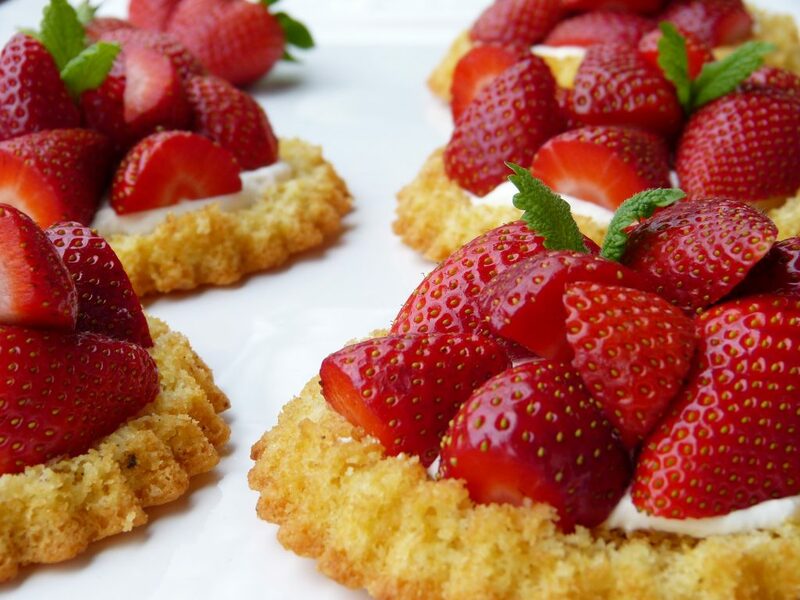 Top the shortcakes with some strawberries and the results will amaze you. Where a recipe calls for both Bisquick and butter, there is a lot that you can do to get finger-licking desserts. If you rub the butter and flour together in your hands until you get a pebbly texture, you will end up with buttery layers which make your shortcakes taste great. This method is quite easy, and you will have lots of fun when doing it. Another secret when it comes to Bisquick shortcakes is that the dough must be tender and there are many ways in which you can achieve this. First off, ensure that you measure the ingredients as per the recipe. Though you can make variations, it is always good to stick close to the stipulated measurements to achieve the right dough consistency. Go easy on the mixing. It’s quite easy to enjoy the blending so much that you forget to check on the time taken. You can end up getting a consistency that is hard to work with and one that will not result in delicious shortcakes. A good rule to follow would be to stop mixing once the raw flour pockets in the batter disappear. Otherwise, your shortcakes will be hard. 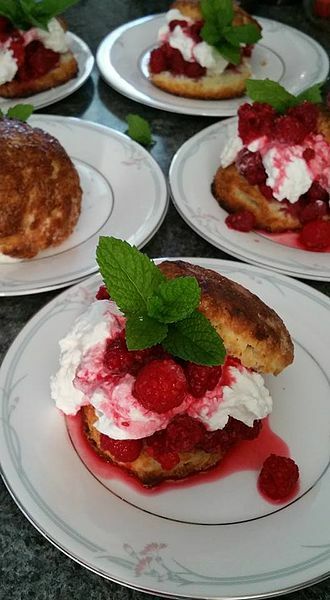 Shortcakes come out great when baked at high heat for a short period. Ensure that you do not over bake your batch by closely watching them as they cook. Once the eight or so minutes are due, be sure to check and take them out if they are ready. Ensure that the whipped cream that you use is of high quality so that you get great results. You can even opt to make your own in huge batches, and you can use it in other recipes. While strawberries are the preferred option in this recipe, feel free to work with other fruits depending on the season. From peaches to blueberries to frozen fruit, go with what is available at the time, and you won’t regret it. There are other variations of the Bisquick shortcake recipe including Bisquick chocolate-strawberry shortcakes and gluten-free Bisquick shortcakes. So feel free to play about with other ingredients and see how your Bisquick shortcake in a pan comes out. Thank you!